After a successful 3DS Virtual Console début in both Japan and Europe earlier this year, the 1995 Game Boy title Donkey Kong Land is finally on its way to North America. Evidence of the anticipated re-release has appeared via the ESRB. 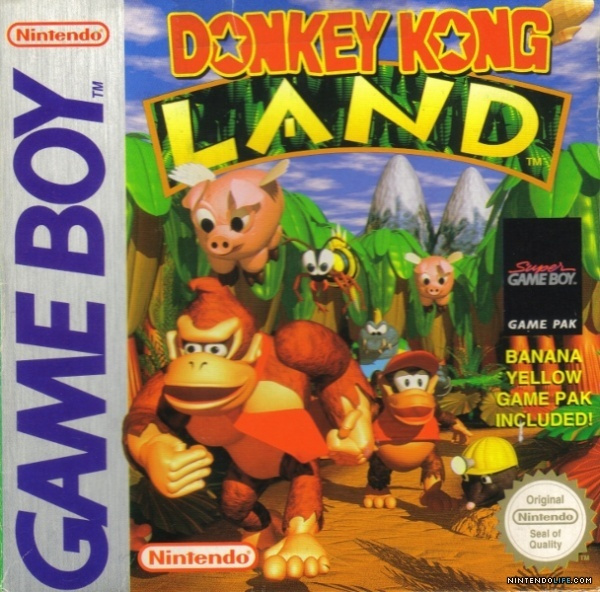 Released a year after the success of the Super Nintendo original, Donkey Kong Land has the Kongs recapturing their banana hoard when Cranky becomes jealous of their initial success. 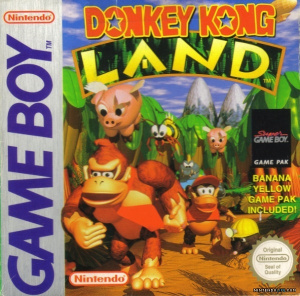 With four worlds, and the same level archetypes as Donkey Kong Country, Donkey Kong Land is considered just as ground-breaking in a multitude of different ways. If you’ve been awaiting the release of this game, let us know in the comments. But what about the original? Let's hope this means Nintendo and Rare are back together...or at least Rare gave them back the rights. Cool, I've definitely been awaiting the release of the DK Land games. Now we just need the Country trilogy on Wii U VC. Which, I assume isn't too far off considering this news. Yes!!! I had this game but lost it at a hotel twelve years ago. I am so buying it! Is it (fully) owned by Rare though? I suspect there was a legal battle (or talks) behind the scenes regarding the Rare DKCs prior to the removal of it in Wii VC. And Nintendo eventually won (or settled?) that's why we have DKC series back on VC. On the one hand, I'm glad if this means the whining for the old DKC and DKL games will end soon. On the other hand, I'm certain there will be something else ready to replace it. @BensonUii: Microsoft owns the engine that was created by Rare and the characters that were created by Rare for the game like the King K Rool for example. Nintendo owns the Kong characters since DK is Nintendo's IP. @Tasuki Where did you read that? Finally! Now all we need are Game and Watch 3, F1 Race, and Pokemon! Then that would be the COMPLETE Game Boy and Game Boy Color Virtual Console collections. Nintendo owns all the characters, including K. Rool. K. Rool has appeared in many newer Donkey Kong games as well as Mario Super Sluggers. It's about time! I've always loved the SNES series, but only had DKL3 on the GB. I figured the wait would be longer than this though! Cant wait for this to come to europe, it was the first game I ever played. @blaa6 Rare isn't what it used to be, many of those responsible for the golden age of Rare games have long since departed, including the Stamper brothers who founded the company. That yellow game pak was great! I never played the portable DKC games, so I may get this. This has to mean that the DKC Trilogy is closer to being released on the Wii U VC. Right? Seriously, it seems NoA likes to torture us. Land but no Country? Come on! @AlexOlney True, but there are so many great IPs they still own. I'd love to see a collaboration with Nintendo to release a new Banjo game on Wii U and Xbox One, for example. I mean, Mojang keeps working on Playstation versions of Minecraft even after the buyout, right? Not nearly as good as DKC, but still a pretty good little game. Nintendo owns the IP, Nintendo has all the right to release the the DKC games. They own all the characters and everything within those games. They don't need to ask Rare's permission for anything when it comes to the Donkey Kong series. There is a reason why you don't see these games on Microsoft consoles. As for it being removed from the VC, it was probably removed from the VC because Nintendo wanted to remove it for whatever reason. This is not true, Rare does not own characters like the Kremlins or King K. Rool. These characters are owned by Nintendo. In Fact, all characters within the Donkey Kong Series (regardless of platform) are owned by Nintendo. This is why Dixie Kong, Cranky Kong, Rambi, Squawks, etc. are owned by Nintendo and not Rare. @ricklongo Mojang only keeps making Minecraft on Sony consoles due to pre-existing contracts. Once those are up you won't be seeing Minecraft anywhere Microsoft doesn't publish it. Similarly, unless Microsoft wants to publish a new Rare game on Wii U, it's never going to happen. And there's essentially a zero percent chance of that ever happening. @Daemonico655321 I agree though one of the barriers is that Nintendo won't put their own N64 games on the Wii U virtual console. To play the classics such as Super Mario 64, Star Fox 64, Ocarina of Time, Majora's Mask, F-Zero X, etc. you have to load up Wii mode. @thesilverbrick Well, after the Microsoft purchase, Rare has developed games for Nintendo platforms, such as Viva Piñata for the DS, and that was published by THQ, not Microsoft. Then again, it should be noted that Microsoft had no dedicated handheld gaming device to compete with the DS; when it comes to home consoles, it's a very different panorama. Truth be told, I don't think we'll ever see another Rare game on Nintendo platforms - even on handhelds, since Microsoft might consider the Windows Phone as competition for the 3DS. Played one of these Donkey Kong Land games when I was a kid, I'll definitely pick this up! Wait, so if Rare does not own K. Rool and the Kremlings, then how come Nintendo didn't use them for Returns or Tropical Freeze? @RadoGoji maybe they wanted a new villain? Plus it was Retro who made them and Nintendo did give them a lot of freedoms.Even more so that between the two games that Retro did, they didn't recycle the Villains which makes me believe they just did it to have new villains. Also, for tropical freeze, I don't think reptiles would have done so well in the cold. My first and only Donkey Kong was Country on the Nes when I was little. It has been the only DK game I have played. I do want to try this though. @blaa6 Oh for the love God! That ain't gonna happen! MOVE ON! I just hope this and the other DK games hit the VC before the end of the year so i can get some extra points in the digital deluxe promotion! I haven't tried this one, though I had the second Donkey Kong Land game back in the day (also a yellow cartridge). Wouldn't mind giving this one a go. I honestly thought we'd never be getting this. Well, at least it's not summer of next year. Please Nintendo, let it happen. Loved this game in original banana yellow cartridge... I refuse to get this game on VC until Nintendo implements the the "Super Game Boy" Colours and extensions as a toggle option!! @blaa6 What are you talking about? Rare never had the rights. That was a speculative rumor proven faults long ago. I accidentally formatted my 3ds. I thought i lost all my games. But i was pleasently surprised that i could redownload my games from the e shop on my 3ds! Can't wait. Also looking forward to all the DKC titles. Hopefully its a Christmas release. Me too i am starting to think it is going to be a December 25th release because the WII U is getting Duck Hunt on there Virtual Console. I think next week we may get a lot of virtual console on the 3DS also i think next week we could also get Lufia: The Legend Returns. Next week NOA may give us a good Christmas present.That is also why we did not get anything on 3ds virtual console this week. They are going to pull a big release on both the 3DS and WII U Virtual Console. Also I think donkey kong land 1 is going to be 3.99 scene that is the highest price on a Game Boy game and in both japan and Europe it is 400 yen and 3.99 euro.